In his midterm campaign rallies, President Donald Trump has repeatedly made the preposterous claim that he came up with “the greatest idea” for “veterans choice” — a program that was launched in 2014 during the Obama administration. He also claimed it took “44 years” to get the legislation passed. In fact, nothing he said about the program’s origin is true. But I thought it was so brilliant, I came back to my group, I said, I got the greatest idea, because I haven’t been doing this that long, so, you know, it wasn’t like high on my list, but it became high. I did know the veterans were never treated fairly. But I said, I have the greatest idea. We’re going to do this. If a veteran has to wait, we’re going to send them to a private doctor. We’ll pay the bill. What a genius — I said, I said, how good is that? They said, “Sir, we’ve been trying to get it passed for 44 years.” So I was good at getting things passed. That’s what I did. In fact, that was the idea for the Veterans Choice Program, which was created by the bipartisan Veterans Access, Choice, and Accountability Act, signed by President Barack Obama on Aug. 7, 2014. The legislation, which garnered a 91-3 vote in the Senate and a 420-5 vote in the House, followed a scandal over wait times at Veterans Affairs facilities. Since Trump took office, he has continued the program, signing legislation to provide funding for the program and to eliminate the expiration date. 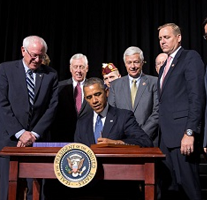 In June of this year, Trump signed the bipartisan VA MISSION Act, which provided funding to keep the Veterans Choice program for one more year, and then called for consolidating it and other private-care options into a new Veterans Community Care Program. The MISSION Act — a “significant portion” of which came from earlier bipartisan legislation from Republican Sen. Johnny Isakson and Democratic Sen. Jon Tester, according to the senators — says that under the consolidated program a veteran can go to a private medical provider if “the covered veteran and the covered veteran’s referring clinician agree that furnishing care and services through a non-Department entity or provider would be in the best medical interest of the covered veteran,” based on criteria to be set by the VA secretary. Those criteria will include distance from a medical facility, type of services needed, and the timeliness of appointments. So, Trump has continued the Veterans Choice Program and the new law could expand eligibility for such services. But how can Trump say a law that was passed years before he took office was both his idea and 44 years in the making? We asked the White House press office but haven’t received a response. A Black Man Called His Mom From a Hotel Lobby. Then He Was Kicked Out.